It’s not often that an American Ambassador to Germany recommends you get a cancer screening, but that suggestion only served to highlight for participants at the 40th American Council on Germany Young Leader Conference in Berlin that the transatlantic relationship is about more than policy. It’s personal. U.S. Ambassador Richard Grenell’s recommendation came during an evening discussion with this year’s Young Leaders cohort, hosted at Deutsche Bank at their new “branch of the future” in Mitte. The Ambassador participated in a frank exchange about the current Administration’s take on trade policy and the future of NATO (including the debate over military spending), as well as challenging questions about the media and its relationship to President Donald Trump and America’s man in Berlin. The advice that everyone get a cancer screening came at the end, after Ambassador Grenell spoke of his own successful battle against cancer, which he credited for giving him the courage to make decisions and stand by his positions. Now in its 45th year, the conference opened with a tour d’horizon from former Foreign Minister Joschka Fischer on Sunday night. On Monday the group convened in the Bundestag’s Jakob Kaiser Haus to hold a record four plenary discussion sessions. Along the way, they also welcomed guest speakers such as EU Commissioner Günther Oettinger; the President of the European Investment Bank, Werner Hoyer; and State Minister Niels Annen from the Foreign Office, as well as a midday panel discussion with German journalists Ali Aslan (2010 Young Leader) and Matthias Deiß (2008 YL). They then had the opportunity to tour the historic Reichstag building itself, whose rooftop terrace and iconic glass dome provided spectacular vistas of the bustling German capital. That action-packed first day provided an appropriate beginning for a week that included briefings on the state of the transatlantic relationship after the recent NATO and G20 meetings as well as the current state of German politics. In addition to a total of 10 plenary discussions on topics ranging from the meaning of national identity and the future of NATO to the problem of inequality in modern society to the role of privacy in the tech economy, the group also visited the German Tech Entrepreneurship Center (which included a conversation with Deputy Government Spokesperson Ulrike Demmer) and the Federal Chancellery (where they met with two key advisers to Chancellor Merkel – Senior Director for Security Policy Dominik Mutter and the Head of the Immigration Policy and Integration Unit, Honey Deihimi). As they engaged with one another in both formal and informal discussions over their five days in Berlin, the Young Leaders also welcomed further guest speakers: State Secretary Dr. Rolf Schmachtenberg of the Federal Ministry of Labor and social Affairs; Steffen Kampeter, Managing Director of the Confederation of German Employer Associations; State Secretary Dr. Georg Schütte of the Federal Ministry of Education and Research, and Lt. General Markus Laubenthal from the Federal Ministry of Defense. 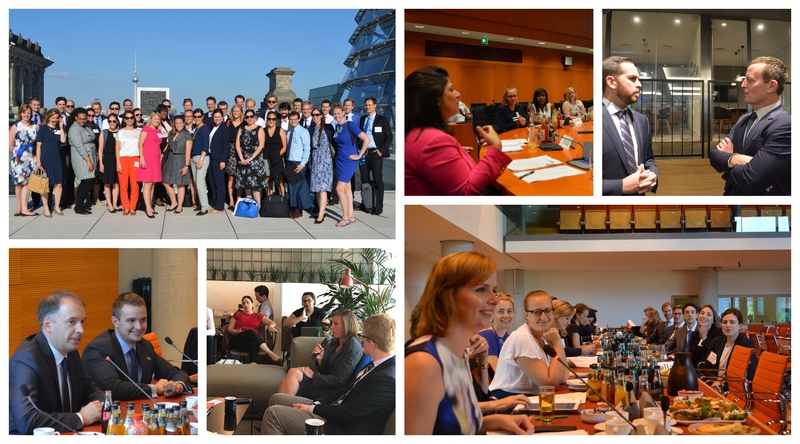 By the time the Young Leaders went their separate ways on Friday, they all agreed that the week had deepened their mutual understanding – personal and political – and inspired a greater desire to continue the work of transatlantic cooperation upon which the ACG is built. The ACG is very grateful to the following hosts and sponsors for their support of the conference: the Anna-Maria and Stephen M. Kellen Foundation, AT&T, Daimler AG, Deutsche Bank AG, the German Tech Entrepreneurship Center (GTEC), Hering Schuppener Consulting, Noerr LLP, Pfizer Deutschland, and Steelhead Partners, LLC. Special thanks also go to Michael Dzeba (2015 YL), Ludwig Preller (2014 YL) of GERMANTECH DIGITAL, and Dennis Wetzig (2016 YL) of PIXRAY GmbH for their support of the Munich program before the conference. The ACG is also grateful to the Steering Committee for all of the time and effort devoted to the success of the conference. The committee members are: ACG Board member Edward S. McFadden (2002 YL) (Committee Chairman), Secretary of Communications at the Archdiocese of Washington; Antonin Finkelnburg (2008 YL), Head of Public Policy at Arbeitgeberverband Gesamtmetall; Ron Granieri (2000 YL), Executive Director of the Center for the Study of America and the West at the Foreign Policy Research Institute and Director of Research at Penn’s Lauder Institute; and Sarmad Hussain (2005 YL), Senior Expert in Public Affairs at Deekeling Arndt Advisors in Communications GmbH. The Young Leaders Conference, launched by the American Council on Germany in 1973, is designed to enhance up-and-coming professionals’ understanding of domestic, bilateral, and global issues affecting the United States and Germany while deepening mutual understanding among the next generation of thought leaders and decision-makers from both countries. The weeklong conference is only the beginning; Young Leaders continue to meet over time to exchange ideas and reinforce the bonds forged during the conference.